Take advantage of a rare opportunity to get designer eyeglass frames at half the retail price! 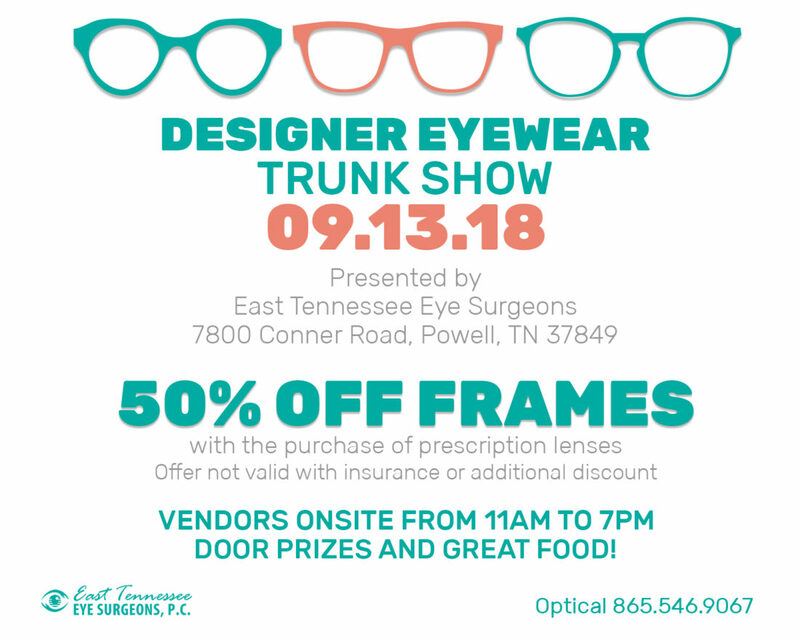 On Thursday, September 13th, East Tennessee Eye Surgeons will host a designer eyewear trunk show at our Powell location on 7800 Conner Road. Vendors will be onsite from 11 a.m. to 7 p.m., offering a 50% discount on designer frames with the purchase of full-price prescription lenses. There will also be great food and door prizes, including but not limited to designer cases and a free pair of Calvin Klein sunglasses that can be fitted with prescription lenses. The 50%-off discount is not valid with insurance or additional discounts, and applies only with the purchase of full-price prescription lenses. Opticians will assist customers in ordering their frames and lenses. Customers should bring their current prescription (given within the past year) to the trunk show. Customers without a current prescription will be able to make an appointment for an eye exam and the 50% discount will still be honored. The trunk show is the perfect opportunity to get a fresh look with a new pair of frames, so come on out to 7800 Conner Road in Powell on September 13 to take advantage of this fantastic deal. We look forward to seeing you!